On March 8, 2007, my Grandpa, Talmage Skeen (seen here holding Jenna), passed away. He had been battling cancer and emphysema. Although he is no longer suffering, losing a loved one is never an easy thing, but in regular Skeek fashion, the funeral was a good time. We'll miss you Grampa Tal! 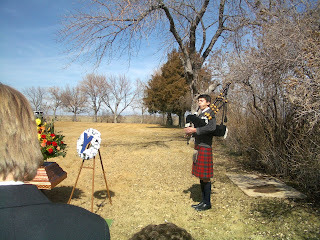 Cousin Daniel serenaded us with a lovely bagpipe solo of "Amazing Grace." 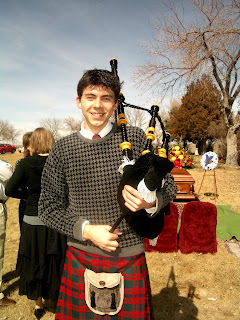 Then he tried to assault me with his bagpipes. We like Daniel. Whilst out in Warren, Utah for the graveside ceremony, we stopped by the Skeen Dairy Farm to show Matt what he'd really married. This here is a watering trough. Back in '81 when they were pouring it, my dad whipped out my little, pudgy baby finger and made it mine forever. Sweet huh? Bishop Skeen and his daughters. My cute girlie cousins. Thanks for letting me be in the picture even though I look like a poor little raggamuffin. Jenna, Daddy's little hoop star. ...and later on we cut Hilly some bangs.